Biking the Trail of the Underground Railroad A group of cyclists is riding 2,100 miles along the Underground Railroad. The journey from Mobile, Ala., to Ontario, Canada, follows the route that many slaves used to escape to freedom. 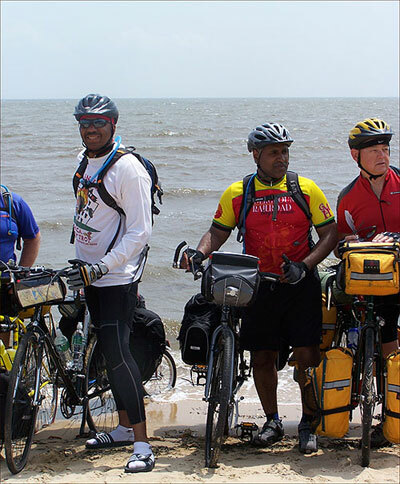 At the start of the trip, Norman Peterson, Mario Browne and George Olmstead dip their wheels into the Gulf of Mexico, where the last known slave ship arrived in the United States. The group of cyclists prepares to leave Milford, Ohio, for the next stop on the tour. Listen to Taj Mahal sing the spiritual "Follow the Drinking Gourd." The path the cyclists are following is based partly on the song. 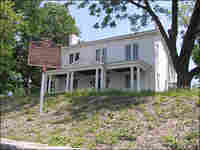 The cyclists stopped at the Harriet Beecher Stowe House in Cincinnati on their trip. Beecher Stowe used some of her experiences from living in Cincinnati while writing Uncle Tom's Cabin. A group of cyclists is riding 2,100 miles along the Underground Railroad this month. The journey from Mobile, Ala., to Ontario, Canada, follows the route that many slaves used to escape to freedom. The multi-racial group of travelers say they have been deeply affected by the things they have seen and learned during their trek. 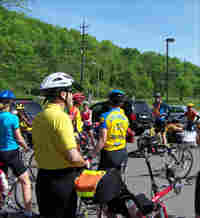 I joined the riders as they traveled in the Cincinnati area — about halfway through their journey. The riders travel loaded down with gear like tents, clothes and cooking fuel. Colleen Shino of Salt Lake City says the trip has been physically hard but worth it. "When you are riding the route and thinking about the slaves escaping to freedom — taking some of the same paths that you are, being chased by ferocious dogs — we can relate to that, although they did it at night being chased by bounty hunters and slave owners," Shino says. "So it's been very interesting." The riders left Mobile on April 14. There, they visited the slave market and a community formed by Africans who escaped from the last known slave ship to come to the U.S. in 1860, more than 50 years after the importation of African slaves was outlawed. The average age of the group is 60, and the oldest rider is 77. The six-week tour costs nearly $2,700. The path they are following is based partly on the spiritual "Follow the Drinking Gourd." The "Drinking Gourd" is a colloquial name for the "Big Dipper," the constellation that points to Polaris, the North Star. Many slaves followed that star north to freedom. 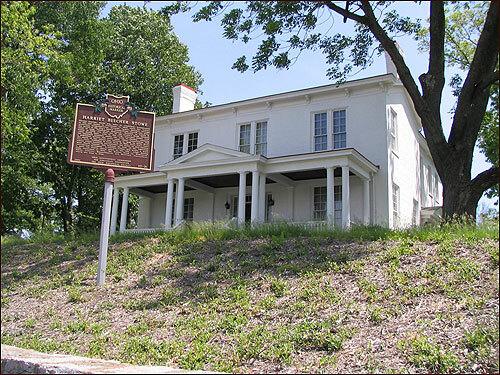 As the travelers ride, they stop in key cities along the route and visit sites like the Harriet Beecher Stowe House, where the author of Uncle Tom's Cabin once lived. Some of the cyclists only joined the group for the Cincinnati segment. One, Dennis Jones, says he believes tours like this are important because they remind people of what they can learn right in their own backyard. "I didn't know about this house. I live here and didn't know anything about it. Now I know — and when you read things it becomes more interesting and it keeps people aware," Jones says. "And Lord knows we need to keep the awareness alive because it is slipping away." The riders set up tents outside of the National Underground Railroad Freedom Center, nestled on the banks of the Ohio River. Less than a quarter-mile away, on the Kentucky side of the river, stand white antebellum homes where slaves once worked, looking across to a freedom most would never taste. Inside the Freedom Center, curator Carl Westmoreland walked riders into a rebuilt slave pen, a log cabin-like building that housed slaves for 30 to 60 days before they were sold at markets like the ones the cyclists visited in Mobile. The trip's leader, Alvin Justelien, says the ride has been like a ministering program to him. He says he hopes people learn about the love it required for those involved in the railroad to put their lives on the line to help others. "A lot of people try to make it a black and white thing, and it's not because both blacks and whites suffered if they were caught," Justelien says. "Whether it was escaping slaves, whether it was whites trying to help the slaves, or whether it was black free people helping the slaves escape, everybody was in jeopardy." Most of the riders on the trip said they hoped it would promote more dialogue between the races. But for the African Americans riding along, it has a more visceral meaning, says Mario Browne. He choked up talking about what it was like to dip his bike wheels in the Gulf of Mexico, where the last known slave ship arrived. "As I look back and I just imagine those human beings stuffed in ships like sardines in the waste and the filth, and the degradation and the humiliation they went through, there is no reason — no rational reason — that I should be standing here today," Browne says. "It is only by God's grace and mercy, so I recognize the significance of it being more than just a bike ride." The cyclists expect to reach Owen Sound in Canada, the final terminal of the Underground Railroad, on May 30.